The American-made Safe Zone Bicycle Helmet Mirror is simply the highest-quality helmet-mounted bicycle mirror on the market. Thousands of our customers agree, and often tell us that they find our product is superior in functionality and durability to all competing helmet mirrors. The 2.25" mirror yields an extremely wide field of view, much larger than any other helmet mirror. The sturdy mounting is unparalleled - no weak adhesives or fragile parts to worry about! The arm is easy to adjust, maintains functionality and is guaranteed not to loosen over time. Simply attach the mirror base to the helmet with the included straps, straighten the mirror arm, and snap the mirror directly into the base to install. Once it's installed, peel off the plastic film protecting the mirror. For any mounting difficulties please contact us directly at 971-258-0925 or view the detailed photos and videos on the Safe Zone Installation tab on efficientvelo.com. The Safe Zone Mirror will fit nearly all helmets and we'll provide advice and free supplies to make the mirror work as needed. Another benefit unique to the Safe Zone Helmet Mirror is our unmatched five-year "No-Fault" warranty that comes standard with your purchase. We stand behind our products and personally service this warranty, so you don't have to worry about your bicycle rear-view needs for the length of our warranty. Try cycling the Safe Zone way! 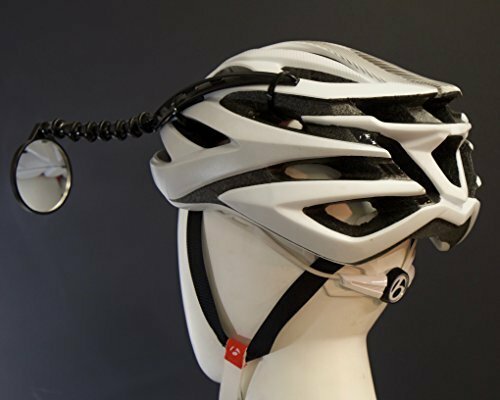 We're sure you'll agree that the Safe Zone is the most effective bicycle helmet mirror made. Please note the Safe Zone ships with a protective plastic film over mirror which must be removed before first use. Once you have the mirror mounted on your helmet, we recommend doing all major adjustments when you're not riding, and with your hand bracing the breakaway point. Once you have it adjusted to a good spot where you can see behind you and it's not blocking the main field of vision for you, you can do "micro adjustments" by moving the mirror when you're on a ride. If you have any questions about this product by EVT, contact us by completing and submitting the form below. If you are looking for a specif part number, please include it with your message.